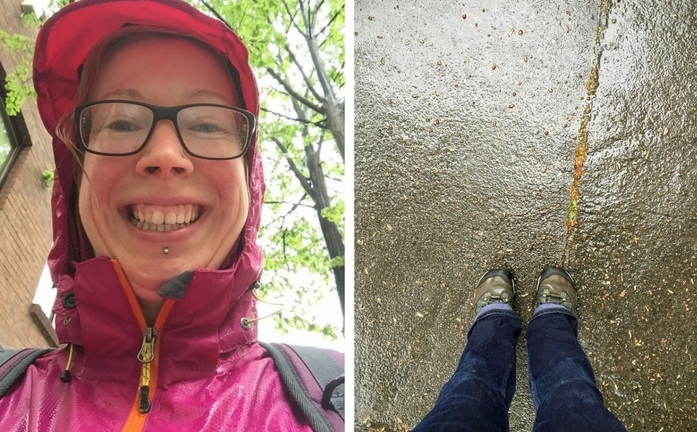 There is absolutely no better way to explore a new city or place than by foot. Earlier this year, I explored Dublin by foot and discovered a fantastic free audio tour to help me learn more about my environment too. Earlier this year, Jit was attending a conference in Dublin for work so rather than letting him go alone (so kind of me!) I tagged along and we made a bit of a holiday out of it. We do this a lot as it can help keep the costs down and also reduces the amount of Annual Leave days that Jit has to take too – plus he has company during the evening. While Jit is at his conference it gives me the opportunity to go exploring alone and one of my favourite things to do is download myself some free audio tours onto my phone so that I can learn some new things, get my bearings and enjoy a really good walk. I think I covered about 75 miles in the short time we were there. No wonder I always need new shoes! 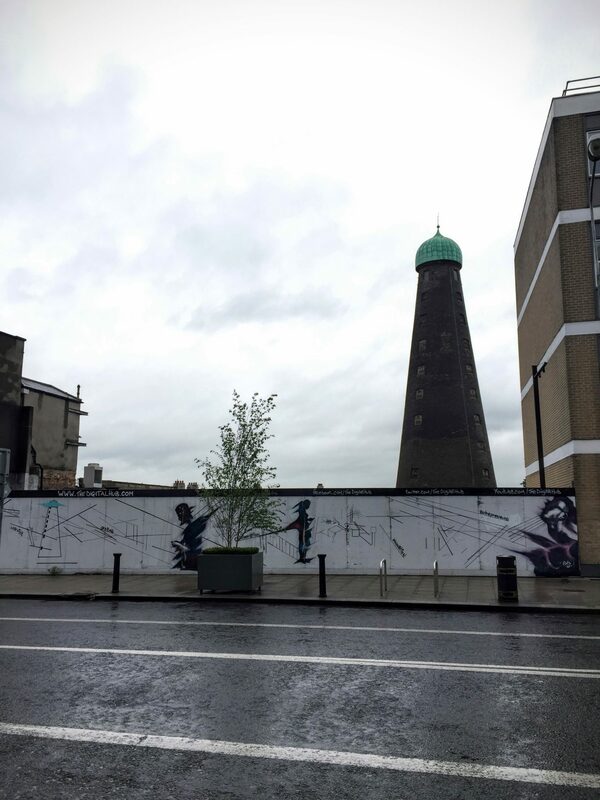 The walking tour app that I discovered is called Dublin Discovery Trails which has six audio tours with differing themes, so there is certainly something to take your fancy. 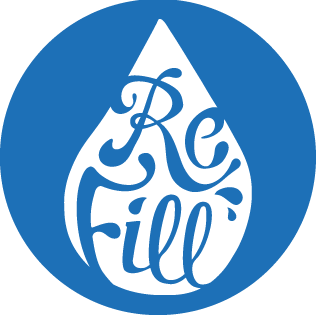 It is available on Android and iPhone. I have only used it on my iPhone 6, so can’t tell you what it is like on Android, but it works really well, has pictures walking information and audio to really help you make the most of your tour. The directions really help you to get your bearings too. 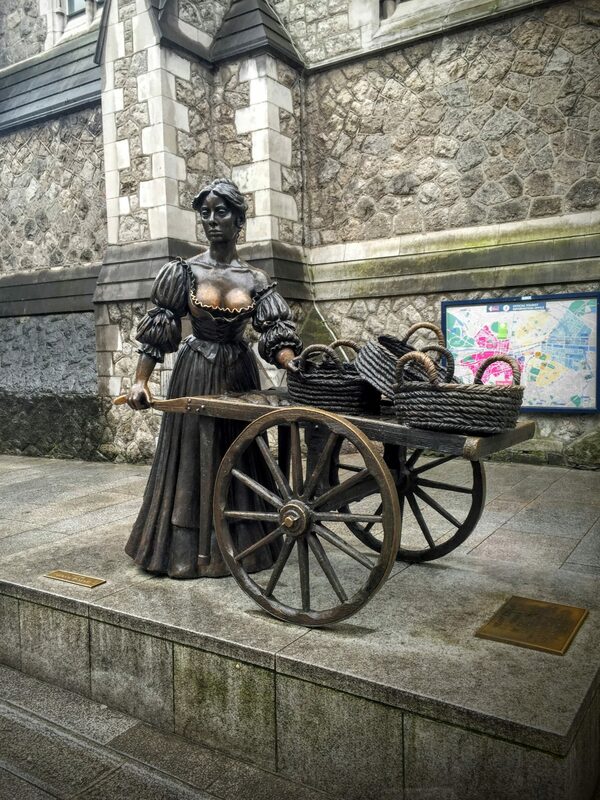 After dropping Jit off at the conference hotel, I headed off on The ‘Real’ Dublin tour for Characters, Craft & Design, which of course in Dublin took me to the statue of Molly Malone and St. Andrew’s Church. While listening to the information in the shelter of the church walls, I almost managed to snag myself a bus tour to the hills having been mistaken for someone waiting for the tour. I obviously let them know and wandered off on the next part of my tour. There are 15 points of interest on the guided tour and each is found by the map and directions provided. You can either listen to the information, as I did, or you can read them. I enjoyed having the choice but in the wet weather, listening was far easier. It didn’t really matter that it was raining so much because there were plenty of trees and places of interest to shelter and learn more about the places of interest. 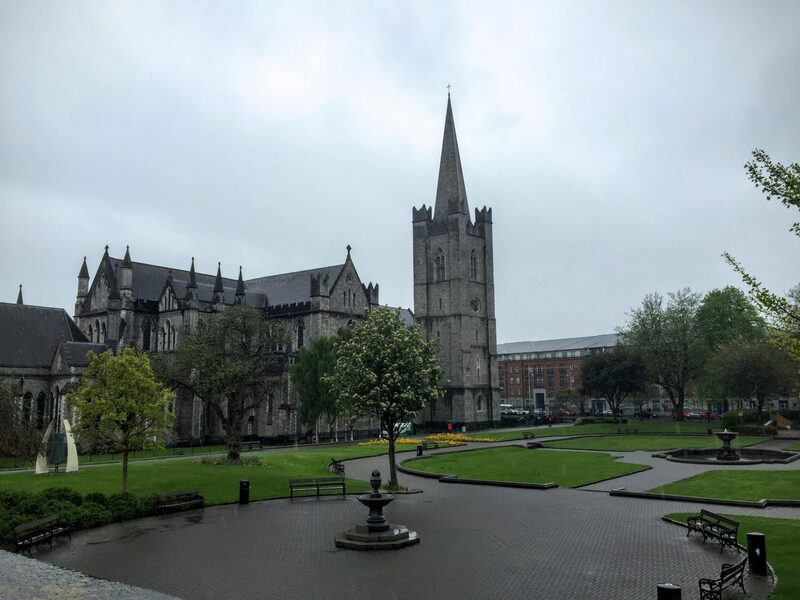 The picture above is of St Patrick’s Cathedral. Is free to pop inside and explore, so make sure you do. A perfect stop (at point of interest 4) to take break from the rain too. Not really! The tour takes you further afield over to the Teeling Whiskey Distillery, which is one of the newest additions to whiskey making in Dublin. We visited there later in the week and I will be doing a separate post on that too – it’s excellent! 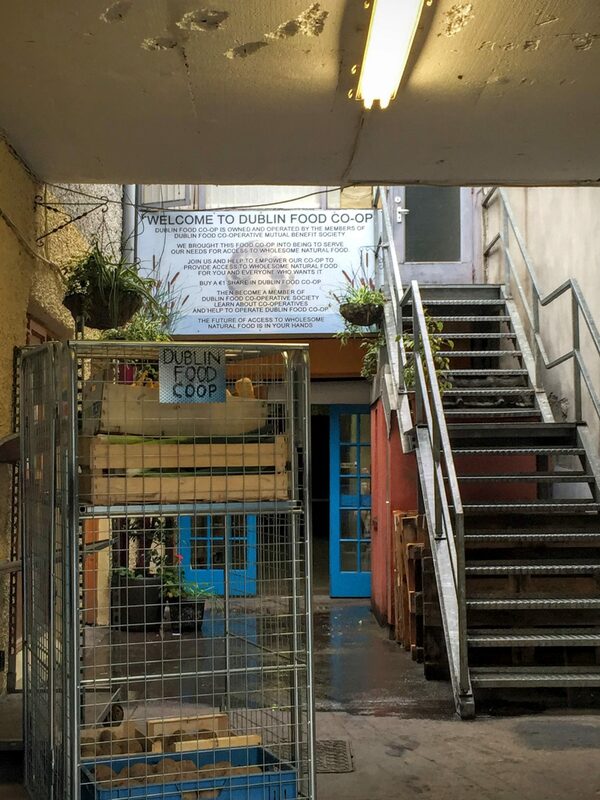 As well as the Teeling Distillery, I discovered the Dublin Food Coop. As a self-confessed eco warrior, I loved the fact that I had found somewhere that did local ethical veggie and vegan food. There is a shop inside selling grocery stuff and there was also a local veg market going on inside when I was there. That led into the large hall where the cafe was situated in the back corner. It was a great place and had the friendly feel of an independent community. 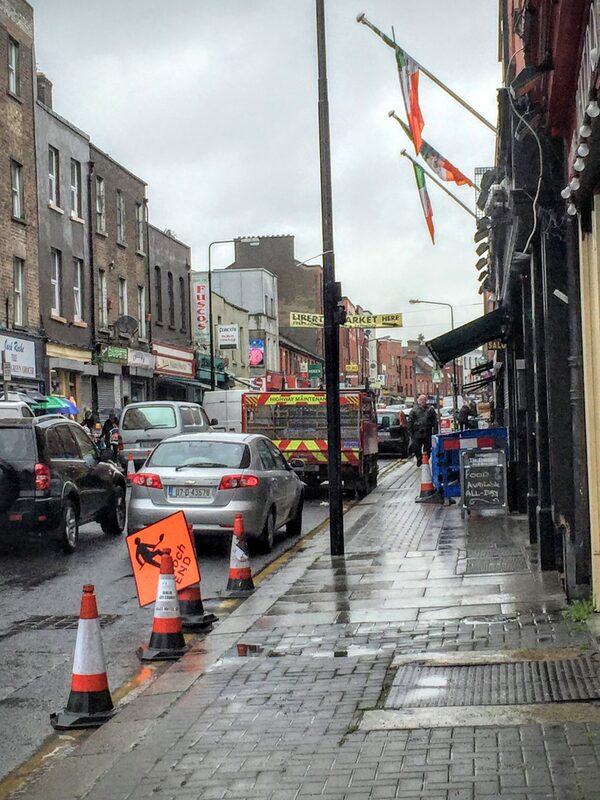 My tour then took me down to the Liberties. The name ‘Liberties’ goes back to Medieval times when the district lay just outside the city walls and was hence granted certain liberties. It quickly became an area that thrived on trade and it has kept the name and the many shops along the row ever since – although they no longer have the same liberties! It was certainly thriving when I was there with many market holders filling the curbs and shops to the other side. It was really enjoyable mingling with the locals and getting a feel for the streets of Dublin. Of course, no tour of Dublin would be complete without having to swing by the Guinness Storehouse, so in that direction I headed. And then around to the tech district where there are loads of new tech start-ups. I love that they are using an old distillery as their building as it keeps the heritage of the area and opens way for new things. I wish Manchester had the same opinion about things! My walking route took me back towards the centre of town to the Chester Beatty library. This is where you can explore the manuscripts, paintings and other intriguing items as part of the museum. 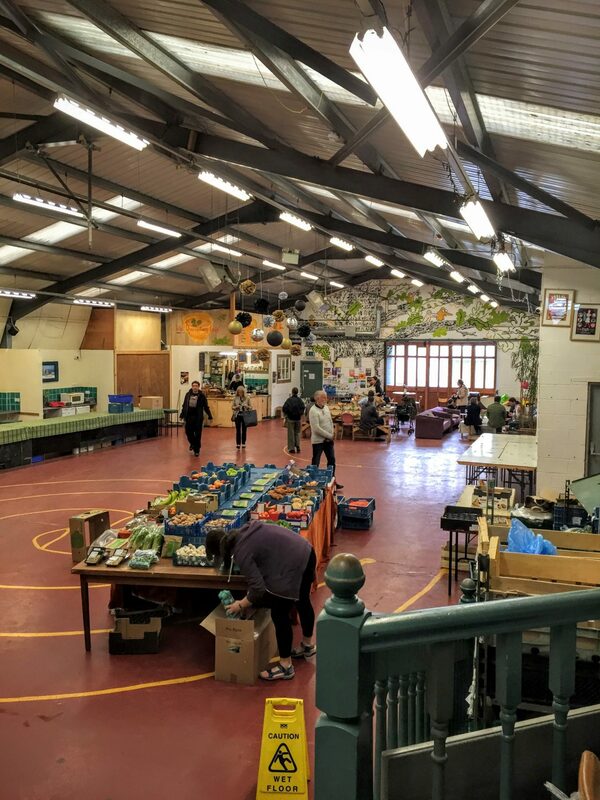 It is free admission and there are lockers so you can shed your coat and backpack for a while, as well as a cafe for a well-earned break if you fancy it. I personally decided to have a break in the park, just parallel to the museum. There were Police personnel practicing for their pass out so that gave me something fun to watch too. 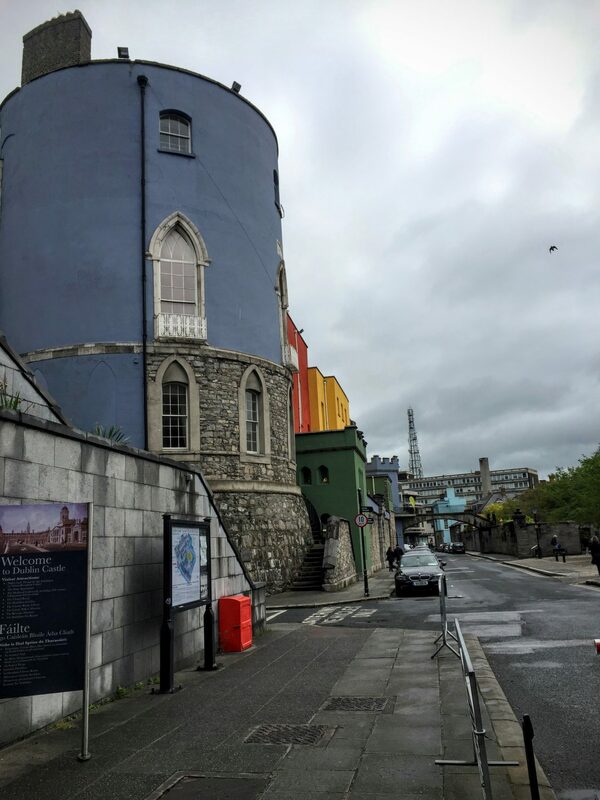 Right beside the museum lies the gloriously colourful Dublin Castle, which although not on this tour is very worthwhile exploring so that you can learn more about why it is so colourful! 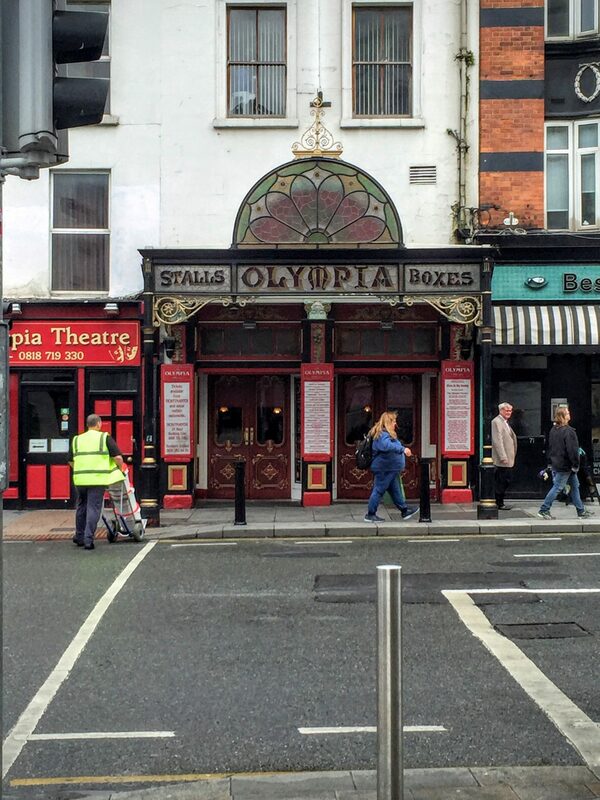 Heading back to the Temple Bar area, I got to see the glorious facade of the Olympia Theatre and a glimpse into the past when I peeped through the doors. 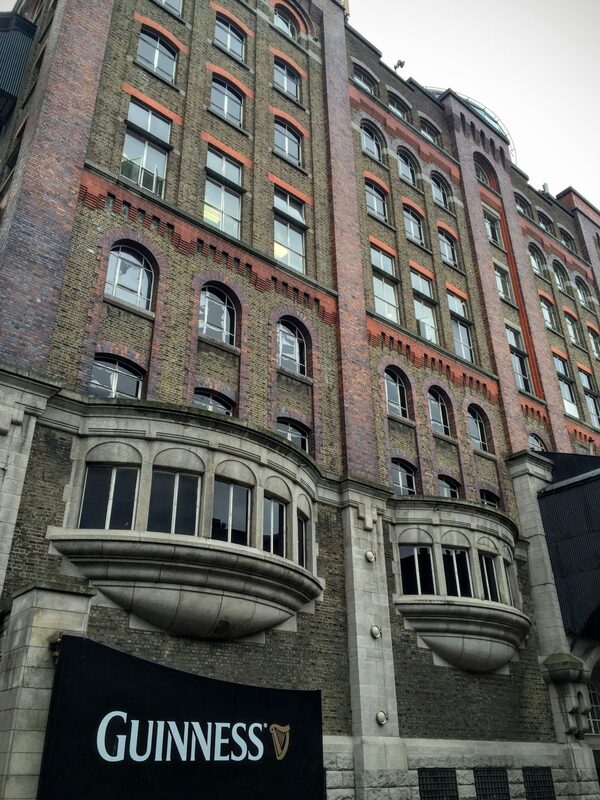 Although seemingly small and unassuming, it has seen acts such as Tom Waits and REM to name just two! Remember while doing the tour at this point to follow the instructions carefully so you can adventure down the secretive little alley where you will discover some exciting and unusual sights! 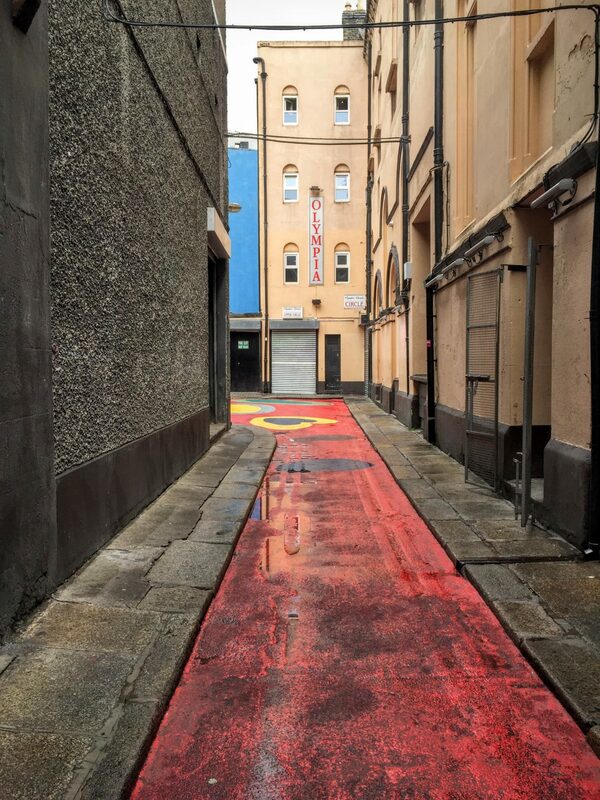 Keep your eyes peeled for the tiny alleyway with the red road which will take you behind the theatre, through exciting spaces and back towards the Temple Bar area. If you’re looking for off the beaten track, this is certainly it! 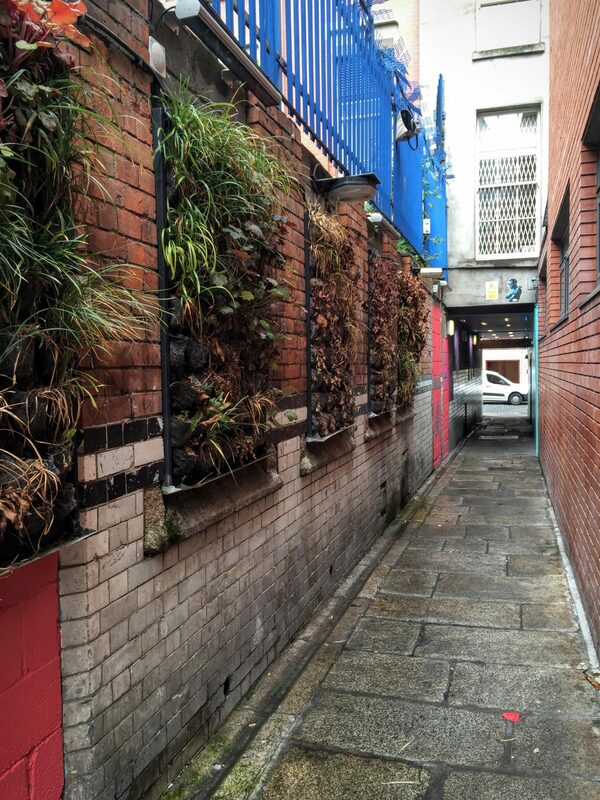 Go straight down this alley and into the square of hearts (you’ll have to visit to see!) and it will lead you to another alley. 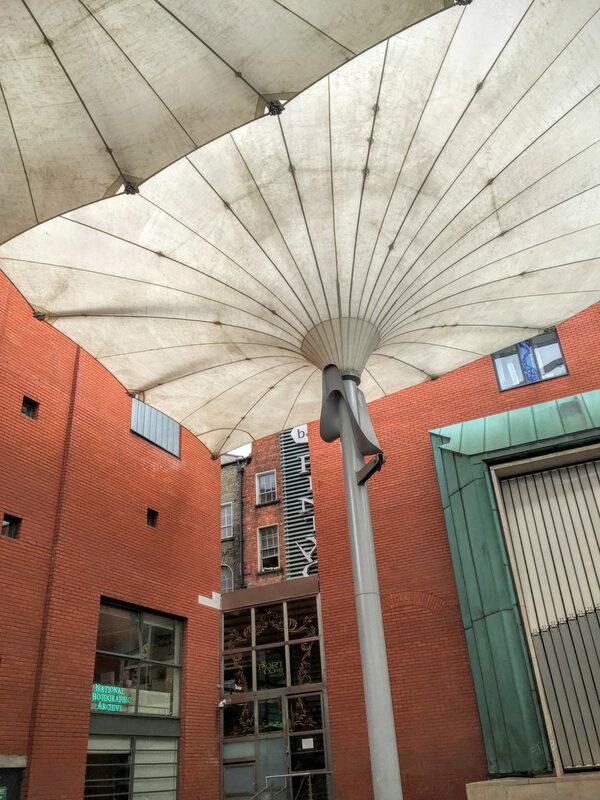 Pass through here and you return to Temple Bar, alongside the Photography Museum (also worth a look) and the square with the most amazing parasols so that you can enjoy the space come rain or shin! I forgot to mention lunch! Remember how I mentioned how I fell instantly in love with the Food Coop? Well, because I had been thinking about it a lot I walked all the way back there for my lunch and it was totally worth it too! 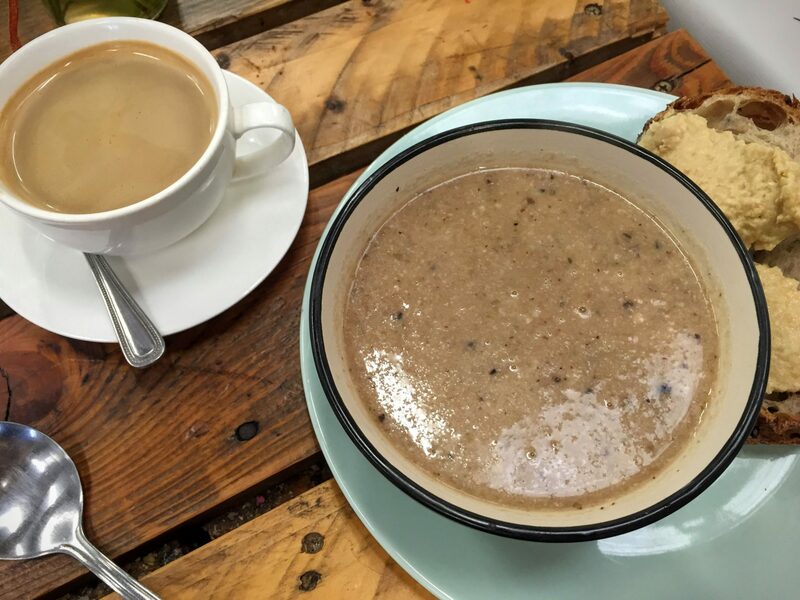 For around a fiver I got a large bowl of cauliflower soup, lashings of houmous on delicious seeded bread and a coffee with soya milk! Plus it was the perfect spot to dry off a bit and plan the rest of my tour. I finished my tour and headed back to the hotel to dry off a bit in anticipation for Jit finishing at the conference. It also gave me time to check through the Itinerary that I had created in the app for sharing with Jit the next day. I have to say that the app is one of the best free walking tours that I have ever done. It is clear with the map and information and has loads of facts to help you to get to know the area. I also liked the fact that I could create a mini itinerary to share with other people – useful when exploring alone or wanting to share the information at a later date. I will definitely be bringing out the Dublin Discovery Trails on my next trip to Dublin – there’s still so much to see and learn! Keep an eye out for more posts from my Dublin trip! Have you ever visited Dublin? Which was your favourite place?